The electronic sound control system from REMUS, called SC15, is a CAN-bus controlled valve system, with a muffler integrated valve. The control unit processes the CAN-bus signals and passes it via the actuator to the exhaust valve. This leads in dependence on engine parameters and riding conditions to an accurate triggering of the valve to optimize the sound under consideration of legal guidelines. 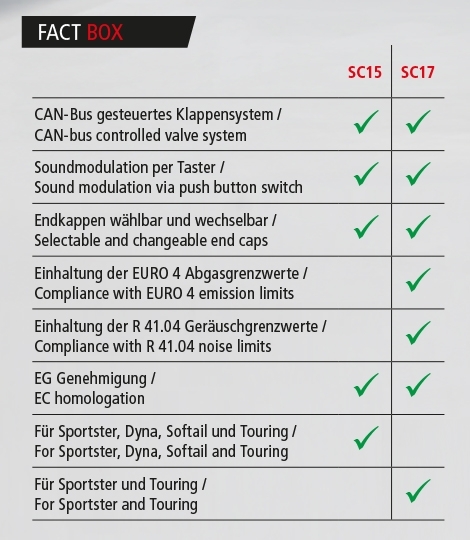 Total new electronics and the optimized hardware of the SC17 ensured that the CAN-bus-controlled valve system fulfills the stringent R41.01 requirements in regards to noise emissions. At both systems the sound can be modulated via a handle bar mounted push button switch. In any situation the complex electronic ensures in dependency of rpm, speed and gear the compliance with the latest sound regulations. 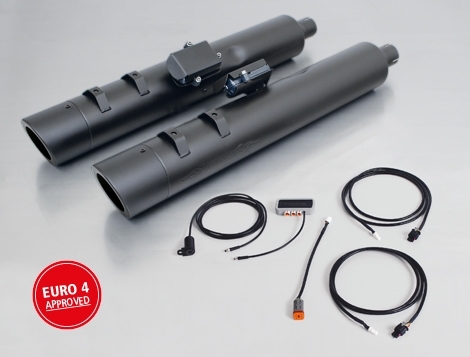 In addition to this, high-quality coated bigger catalysts ensure compliance with the emission limits of the currently valid Euro 4 exhaust gas standard.